The US National Science Foundation has established a program to create a National Science, Mathematics, Engineering and Technology Education Digital Library (NSDL). One of the subsidiary NSDL libraries under development is the National Civil Engineering Educational Resources Library (NCERL). The first phase of NCERL is the creation and collection of digital resources in three areas of civil engineering—geotechnical (soil), rock, and water engineering (GROW). 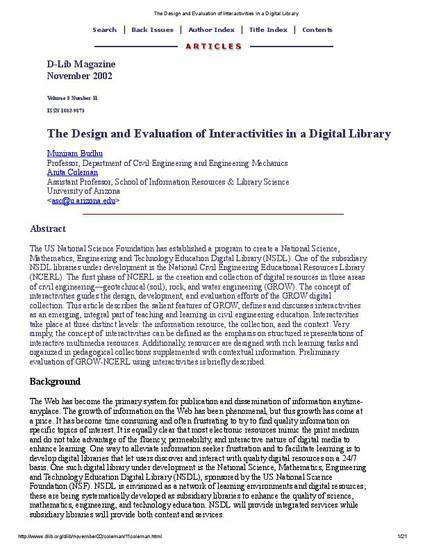 The concept of interactivities guides the design, development, and evaluation efforts of the GROW digital collection. This article describes the salient features of GROW, defines and discusses interactivities as an emerging, integral part of teaching and learning in civil engineering education. Interactivities take place at three distinct levels: the information resource, the collection, and the context. Very simply, the concept of interactivities can be defined as the emphasis on structured representations of interactive multimedia resources. Additionally, resources are designed with rich learning tasks and organized in pedagogical collections supplemented with contextual information. Preliminary evaluation of GROW-NCERL using interactivities is briefly described.